Rosemary offers a unique perspective for anyone seeking personal growth through the gentle spirit and acceptance horses can offer humans. She is a certified EAGALA facilitator and EPONAQUEST Riding Focused Instructor who is dedicated to the ongoing development of personal, professional and business performance using the effective and powerful tools and techniques that NLP and Equine Assisted Learning have to offer. Rosemary has experience working with at-risk women, adolescents and children, young offenders and troubled youth. She demonstrates that horses can provide a means toward self-development, emotional healing and self-discovery. "They teach us about living in the moment, bringing peace, serenity and connection" she says. Rosemary's practice draws from the concepts of herd behaviour, and finds that horses provide powerful experiences from which clients can draw metaphors to life outside the arena. 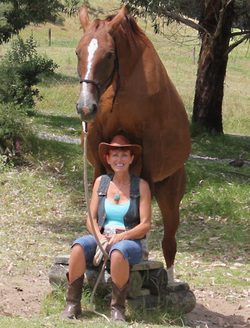 Rosemary practices yoga and rides horses to maintain her own sense of balance. She loves her life of being with horses and creating a space for others to gain benefit from their wisdom. She will assist you with strategies, tools and resources to achieve your dreams and outcomes to live a life that makes a difference.